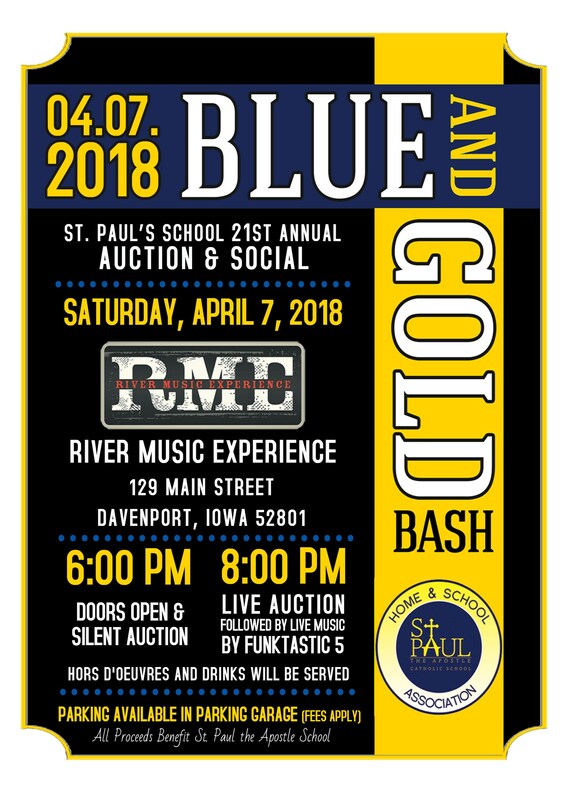 CHECK OUT THE AMAZING AUCTION ITEMS AVAILABLE AT THE 2018 BLUE AND GOLD BASH IN THE BOOKLET BELOW!!! St. Paul the Apostle's Blue and Gold Bash is our biggest fundraiser of the year! Come support SPS! Enjoy an evening of hors d'oeuvres, cocktails, and camaraderie and maybe even go home with a few items from either the silent or live auction... or both! This is a wonderful night to mingle with fellow SPS parents and support our wonderful school! Don't forget you can purchase tickets or even make a donation if unable to attend and its all available online this year!! We're still accepting money sent to school, but this may be ideal for any friends or family interested!